My last British passport was due to expire in March this year. So in November, when I knew I had no travel plans for 6 weeks I applied for a new passport. The online process is impressive, and within a week I had a replacement. On Monday I tried it out, and although looking all shiny and new, the Maltese immigration officers allowed me to enter their island. 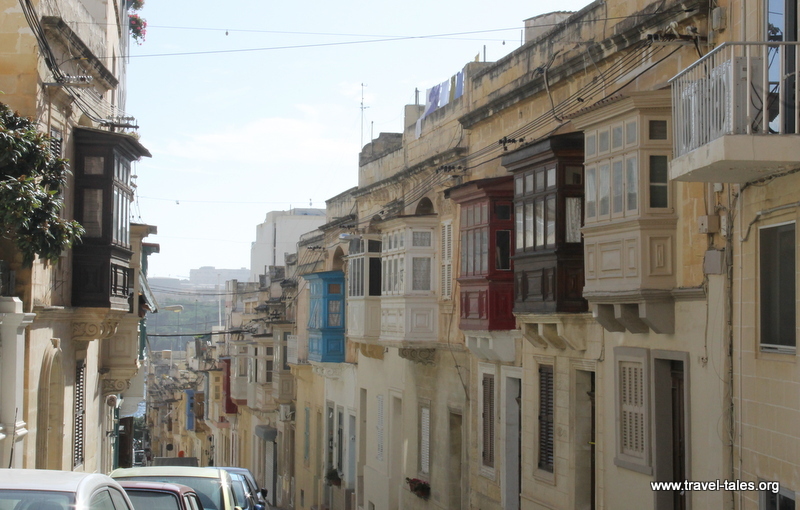 On walking around Sliema I was immediately taken by the Gallarija – covered balconies which adorn many houses in all the old towns of Maltese cities. Being nosy, I tried to peer into them and found that in most cases these are not bay windows. Rather, they are additional rooms which have a single doorway into them in the centre. Many are well kept and painted, with neighbours working together to create good effect, others look like they need a little love! Along the terraces down to the sea, the gallarija is the main first floor ‘window’ in the narrow houses. On flatter areas, the houses are wider like the ones above, and then there are these. The bottom house has got three front doors on it, so is presumably three different homes. In Mdina I saw a house like the one with the brown shutters and gallarija with Sotheby’s but was disappointed to see it was already sold, so no house purchase in Malta imminent. For daily pictures from this blog you can follow me on tumblr, at www.traveltash.tumblr.com and on Twitter @tash_higman. You can follow the current journey ‘live’ by liking the Travel-Tales page on Facebook at www.facebook.com/traveltalesorg where I also post additional small titbits that don’t fit into the blog posts.